This month's Crazy Cooking Challenge was to make a fruit smoothie or shake. The email announcing the challenge came the day after we went to the strawberry patch, so I knew which fruit I would be using! As I started thinking if I had seen a strawberry drink, I remembered Bo's Strawberry Lassi he posted a couple of months ago. I think it stuck out in my mind because I love Indian food, but our local Indian restaurants don't offer a strawberry lassi along with the typical mango lassi. 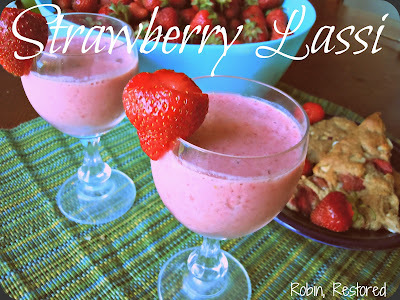 I actually made this drink twice before running out of strawberries. The second time, we had a big group of friends over and they all loved it! The drink is cool and refreshing, especially on a hot summer (or late spring) night, but I really think it's special because of the secret ingredients: cinnamon and nutmeg. Bo's recipe actually called for cardamom, but when I saw the price of cardamom I researched substitutes and came up with a 50/50 mix of cinnamon and nutmeg. I really need to get to a spice store that allows you to buy only the amount of spice you need for these spices that are a little more pricey! Puree strawberries, sugar, and spices until smooth. Add yogurt and ice and blend until smooth.